Karlstejn lies on the river Berounka and is an easy day trip from Prague by train. The Karlstejn Castle was originally built to hold the crown jewels but when the jewels were moved to Hungary the castle fell into disrepair. 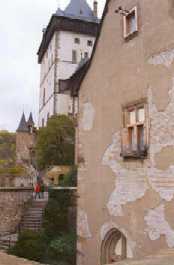 The state of the castle was allowed to deteriorate until the 19th century when Joseph Mocker began the enormous task of restoration. There was quite a lot of controversy over the restoration as Mocker decided that he wanted to restore the castle to how it appeared after completed (in the 14th Century) and eradicated any additions to the castle. In August 2000 the Chapel of the Holy Cross was opened to the public (after being closed for renovations for around 20 years) and is a definite must see. The Chapel's lower walls are covered with semi-precious stones & gold plating whilst on the upper part of the walls hang over 120 gothic paintings of saints. The ceiling is gold and utilises an impressive technique which makes you feel like hundreds of stars are shining down on you. You must book well in advance for a tour of the castle which includes this Chapel. Call (0311) 681 617 to book your place on a tour. The view of the castle from the village below. 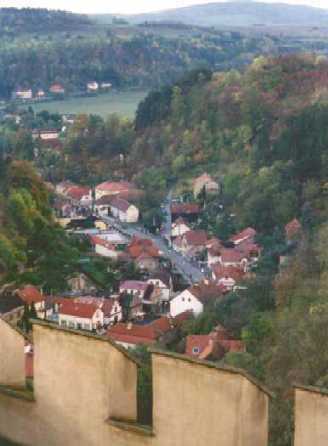 The view of the village from inside the castle walls. 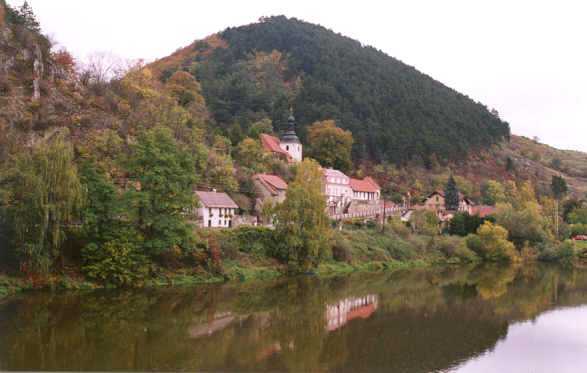 The lower part of the village Karlstejn on the river Berounka.